Mahara comes with Flowplayer, a media player that can play FLV, MP4 (in H.264 format) and MP3 files. Videos are embedded and audio files played with the help of this player. Other video file types can be enabled, but users must have the appropriate software installed on their computers and the respective plugins enabled in their browsers to play them. Width: Choose the default width (in pixels) for a video. Height: Choose the default height (in pixels) for a video. 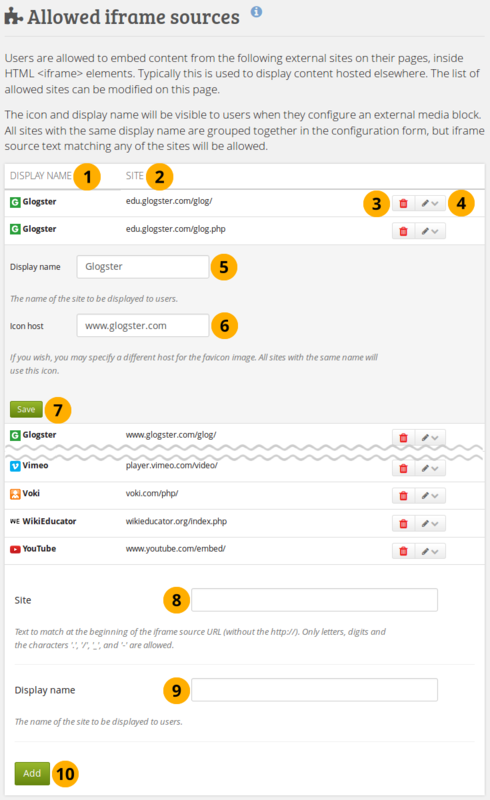 If you allow the embedding of file types that cannot be played by Flowplayer, some users may not have the necessary software installed for displaying these file types. Turn comment ratings on to enable 5-star ratings in the comment section on artefacts and pages. Ratings cannot be on their own and require either a comment or a file attachment. Turn this option on to enable comment ratings. Persona authentication is discontinued as at 30 November 2016. Nobody is able to use that authentication anymore. When you update to Mahara 15.10.6, Persona authentication will be deactivated, and you cannot re-activate it anymore. You can automatically migrate all accounts that use Persona to internal authentication. Institution: The institutions that use Persona authentication are listed. Number of active Persona users: A list of all users that have Persona. The link takes you to the user search page and displays only the users with Persona. Auto-migrate Persona users: Switch to “Yes” if you want to migrate all users to internal authentication that have been using Persona authentication. If you don’t do that, they will not be able to log in. If an institution does not have an internal authentication set, one will be created so that the users can be moved. You will need to inform the users that used Persona as their login to reset their password as no email is sent with the account details. They should go to the “Lost username / password” screen and enter the email address of their Persona account in order to retrieve their username and password. Click the Save button to migrate the users. If you wish to use SAML authentication anywhere on your site, you must provide the path to your SAML php file in these settings. SimpleSAMLphp lib directory: Provide the fully qualified path to the library directory of SimpleSAMLphp, e.g. if the full path to the bootstrap autoload.php is /some_path_to/simplesamlphp_1_3/lib/_autoload.php then this value should be /some_path_to/simplesamlphp_1_3/. SimpleSAMLphp config directory: Provide the fully qualified path to the configuration directory to be used for this Service Provider (SP) SimpleSAMLphp, e.g. if the full path to the config.php is /some_path_to/simplesamlphp_1_3/config/config.php then this value should be /some_path_to/simplesamlphp_1_3/config/. 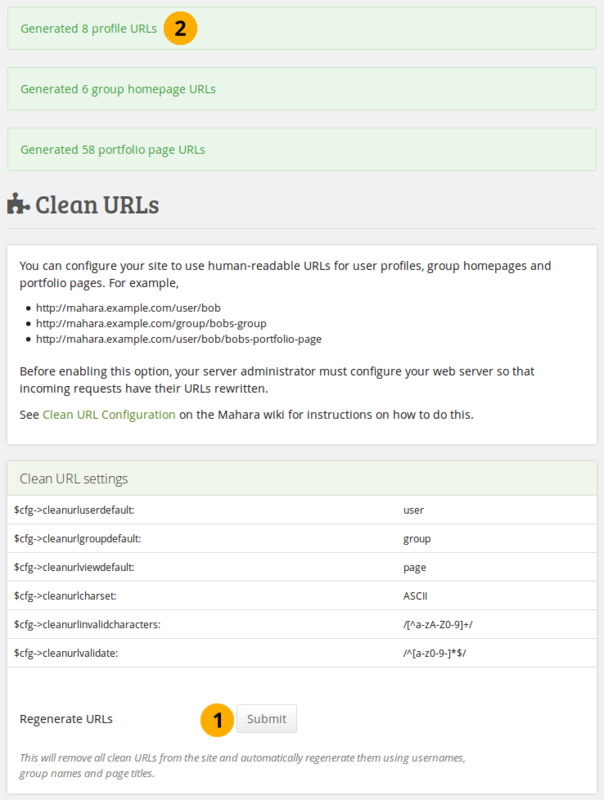 Currently, the plugin can only be used for Mahara instances running on a PostgreSQL database. Work is in progress to extend the support for MySQL for Mahara 1.9. Site: Add a new iframe source by entering its base URL here. Please make sure to leave out the http://. Only letters, digits and . / - _ are allowed.